How Do You Use Your BlackBerry Series: Message Folders - Combined or Separate? From the looks of things last week, it appears that most BlackBerry users don't take advantage of the voice commands on their device (myself included). Our next stop is one that I've always been curious about. BlackBerry email is really the main feature for most users. There are loads of options to tweak your settings to your liking, and depending on just how many email addresses you have on your device, it can be a daunting task. I personally like to have all of my messages land in one spot in the Messages app. 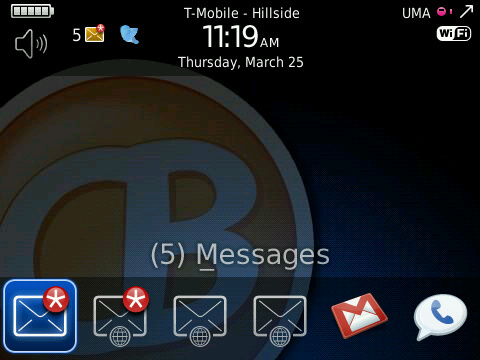 I keep all of my work and personal emails as well as SMS in the same place. I know others like to keep them apart, and have up to 10 individual folders for messages. So our poll today is this: do you keep your messages combined or separate? Cast your vote in the poll, and be sure leave a comment and let us know how you have your message folders setup, and why it works best for you.